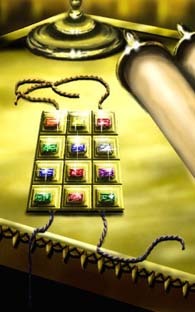 The priestly garments, to be worn by the kohanim (priests) while serving in the Sanctuary, are described. All kohanim wore: 1) the ketonet—a full-length linen tunic; 2) michnasayim—linen breeches; 3) mitznefet or migba’at—a linen turban; 4) avnet—a long sash wound above the waist. Tetzaveh also includes G‑d’s detailed instructions for the seven-day initiation of Aaron and his four sons—Nadav, Avihu, Elazar and Itamar—into the priesthood, and for the making of the golden altar, on which the ketoret (incense) was burned. kohen gadol Rabbi Mordechai Gifter (of the Telshe Yeshiva in Cleveland, 20th century) said that if a righteous man would ever so slightly move one foot several inches, his motion would be heard. This teaches that everything we do, even the seemingly insignificant Mitzvot that we perform, have an impact. Rabbi Moshe Alshich (Israel, 1508-1593) taught: the bells and pomegranates were placed in alternating fashion: a bell, followed by a pomegranate, followed by a bell, followed by a pomegranate, and so on. The Torah is wrapped with a sash, like the priests.